Personal Inury- Winter Storm Danger: using a portable generator indoors CAN KILL YOU IN MINUTES! When the power goes down, portable generators are very handy products but they are deadly if not used properly. 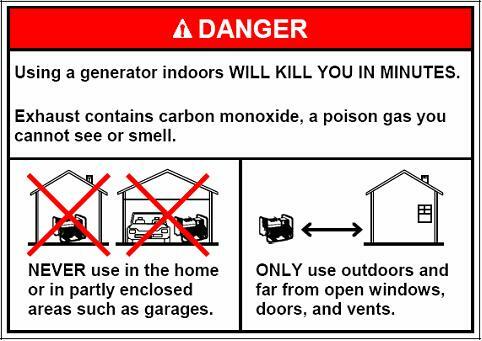 Carbon monoxide poisoning from the the toxic engine exhaust can happen in minutes if a generator is used indoors! From 1999 to 2012, the Consumer Product Safety Commission received 547 reports of Carbon Monoxide Exposure incidents associated with portable generators. 732 people died as a result of these incidents (see CPSC Incidents, Deaths, and In-Depth Investigations Associated with Non-Fire Carbon Monoxide from Engine-Driven Generators and Other Engine-Driven Tools, 1999–2012). Never use a portable generator in your garage, basement, crawlspace or sheds even if the windows are open. The only way to use a portable generator properly is outside and at least 20 feets away from doors and windows. Make sure that the wind doesn’t blow CO into the house. Also make sure that a battery operated Carbon Monoxide alarm is installed in the house! -Make sure your hands are dry before you touch the generator. -Use long heavy duty power extensions free of cuts or tears. NEVER try to power the house wiring by plugging the generator into a wall outlet (backfeeding). This is extremely dangerous and presents an electrocution risk to utility workers and neighbors served by the same utility transformer. To avoid fire hazard do not store the fuel for your generator in your home. If you store it in your garage make sure it is not close to a fuel burning appliance. Before refiling your generator, turn it off and make sure it cools down.